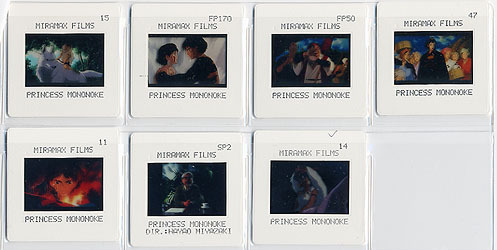 This item is a press kit for the film "Princess Mononoke." It includes six black and white photos, seven photo slides, and a packet of information (cast, crew, and storyline info, glossary, poems, and description of Hayao Miyazaki's technique). The folder for the press kit is signed by Gillian Anderson and comes with a Certificate of Authenticity from the Official Gillian Anderson Website.